i Click 'view all' to instantly compare this fantastic deal with offers on other top travel pillows. 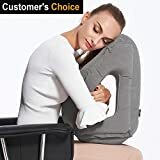 Twist Memory Foam Travel Pillow - Neck, Chin, Lumbar & Leg Support is currently selling at $19.45, approximately $3.84 lower than average, giving a potential saving of $5.54 right now. With a lowest price of $19.45 and an average of $23.29 it is selling on the low end of its usual range. Price volatility is 0.3% (meaning it does not change often), so the price should stay low for a while. Right now this product is a recommended 'fantastic deal'. There is a coupon available for an additional 10% off. The current deal is also the best price on this item over the last month. Compare the current price, savings (in dollars & percent) and Buy Ratings for the top Travel Pillows that are closely related to Twist Memory Foam Travel Pillow - Neck, Chin, Lumbar & Leg Support. Here is how Twist Memory Foam Travel Pillow - Neck, Chin, Lumbar & Leg Support compares with other leading Travel Pillows. 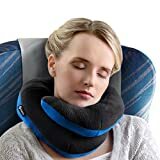 - See and experience the comfort of our bendable travel neck pillow and take it anywhere you go, especially when you have a long distance trip/travels. • EXCEPTIONAL DESIGN - This twist pillow has a flexible joints that can bend into many shapes and allows you to adjust for your neck, head, back and legs. • BUILT TO LAST - it's made of strong, safe and soft material that will last for a long time. This roll pillow has a memory foam inner core which conforms to the body's contours for firm support. It is encased with breathable cotton cover for maximum comfort. • EASY ACCESS and CLEANING - Our pillow cover can be easily removed and washed. 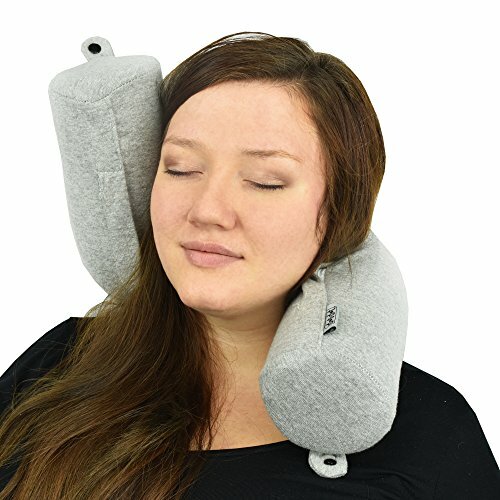 • SUITABILITY - This neck pillow bolsters have button snaps to form a U-shape, which is perfect when it is used as neck pillow and for carrying it around. This is widely used by adults and kids for napping, relaxing and sleeping at home, hotels, spa, office, traveling, land / air trips by train, cars, plane boat and more. - It makes an excellent gift for any occasion - birthdays, holidays, housewarming etc.
? Reliable and quality-checked products.
? Friendly and fast customer support.
? 30-days money back guarantee. Order Now! Our Dot&Dot Memory Foam Twist Pillow is in high demand both at Amazon and other sites, go to the top of the page and click Add to Cart now, before it's out of stock! Features? PROVIDES CUSTOM SUPPORT - Unlike most traditional airline travel pillows, our twistable travel pillows contour to almost any shape and position you want to provide you personalized support and pain relief.? NOT JUST A NECK PILLOW - Dot&Dot travel neck pillow is versatile and is convertible. Use it to support your head, back, shoulder, or cervical spine during a nap, when relaxing or reading on the bed or couch.? A "MUST HAVE" FOR TRAVEL - This pillow makes sleeping more comfortable on air planes, trains, buses or cars. The luxury memory foam cushions the body and relieves painful pressure points for ultimate relaxation.? EASY TO CLEAN - Our memory foam pillow is covered with breathable, machine washable cotton cover so you can easily keep it clean and fresh for your next adventure or trip.